Each year, it seems like new perennial introductions are getting shorter and shorter. 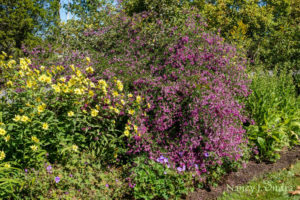 “Dwarf” and “compact” are the buzzwords these days, and sure, there’s a need for restrained perennials in small yards and container plantings. 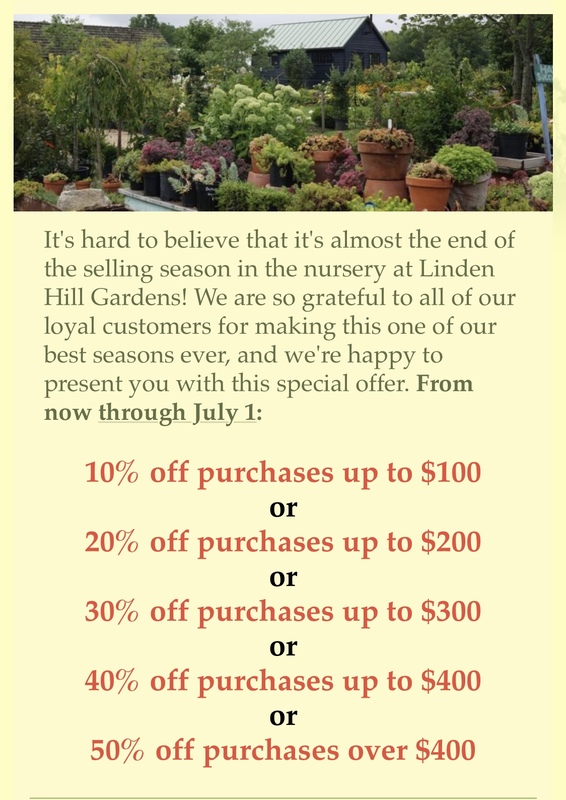 But there’s still a place for big perennials, if you know how to use them right: in an expansive border to flank a driveway, for instance, or to make a big impact in a street-side planting–like the Long Border at Linden Hill Gardens. 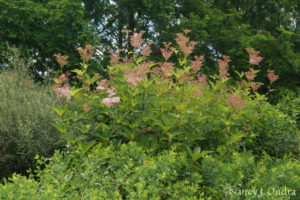 Big perennials also work perfectly for providing privacy or blocking an ugly view, particularly where you don’t want the pruning chores you get with a hedge or shrub border. They also fill in more quickly than woody plants, creating an impact in just a season or two, and many can work in a very narrow space. The abundance of bloom is also a plus. The only potential drawback is that perennial screening is seasonal: mostly just from mid- or late June through October. That coincides with prime outdoor living time, though; you may not require any sort of screen when you’re not outdoors much anyway. If you using perennials for privacy around a ground-level deck or patio, where you’ll mostly be sitting, perennials that top out at 5 to 6 feet can do the job. 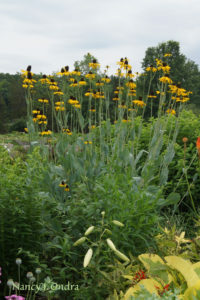 Some good candidates here include ‘Jindai’ Tartarian aster (Aster tataricus), ‘Karl Foerster’ feather reed grass (Calamagrostis x arundinacea), and ‘Henry Eilers’ sweet coneflower (Rudbeckia subtomentosa). 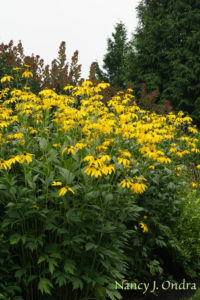 Those that get even taller–in the range of 6 to 8 feet–create even more of screen, and more of a visual impact as well: consider ‘Herbstsonne’ shining coneflower (Rudbeckia nitida), tall ironweed (Vernonia gigantea), Joe-Pye weed (Eupatorium maculatum), ‘Lemon Queen’ perennial sunflower (Helianthus), or plume poppy (Macleaya cordata), to name just a few options. 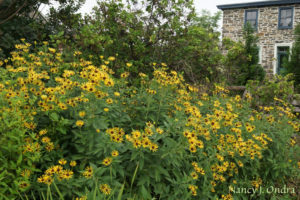 Where you’re trying to create a sense of enclosure but not completely block your view, look to tall perennials that are also somewhat “airy” toward the top, such as giant coneflower (Rudbeckia maxima), ‘Dallas Blues’ switch grass (Panicum virgatum), queen-of-the-prairie (Filipendula rubra), or purple moor grass (Molinia arundinacea var. arundinacea). 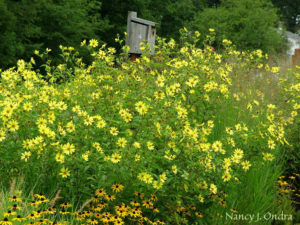 For a denser screen, you want perennials that tend to be leafy all the way along their stems. 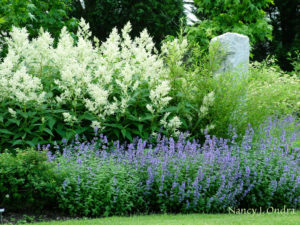 Two perennials that we particularly recommend for this purpose are giant fleeceflower (Persicaria polymorpha) and ‘Gibraltar’ Japanese bush clover (Lespedeza thunbergii). 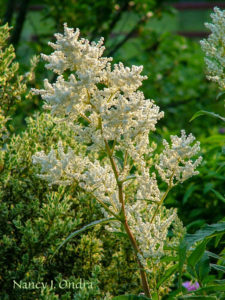 Giant fleeceflower blooms for much of the summer with giant white plumes over densely branched clumps of deep green foliage. Once established a single plant can reach 6 feet tall and 8 to 10 feet wide. 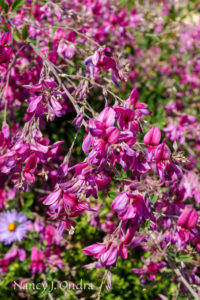 ‘Gibraltar’ Japanese bush clover wait until fall to produce its bountiful display of purplish pink flowers, but it’s a beauty before then as well, creating broad mounds of arching stems clad in tiny green leaves. It too can reach about 6 feet tall and fill a space 8 to 10 feet across. 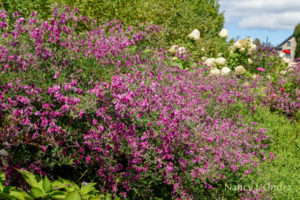 When you see mature plants of either giant fleeceflower or Japanese bush clover in full glory, it’s almost hard to believe they grow from ground level to fill a shrub-sized space over the course of one growing season. And when they are in full bloom, you have an amazing landscape accent as well!